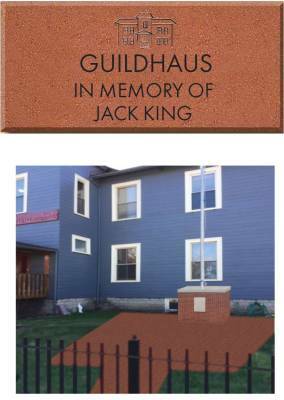 In keeping Jack King’s legacy alive, we are initiating a Guildhaus Engraved Brick Sponsorship Program. As you can see from the color rendering, it will start by honoring Jack and our dear friend, Tom Keating, who as most of our Alumni know was instrumental in getting the House started. In honoring Jack and Tom, we hope to have our friends and Alumni purchase one or more of the bricks, engraved as you’d like. The cost of an engraved brick is $100.00. The space allotted for engraving will consist of 3 lines with no more than 18 characters per line (characters are letters, spaces, numbers, etc.). This would be a wonderful opportunity to have a lasting memory of family and friends of the House who are no longer with us or who owe their own recovery to the House. The engraved bricks will be ordered on September 1st, with the construction of the patio completed by October 31st. Please fill out the form below and use the button to make your payment through PayPal with your credit or debit card, or click the button below to print a form to mail or drop off at the office with your payment. Fill in the form to the right with your information and how you would like the Brick to be engraved on each line. Once finished, click submit. You will make your payment on the next page.